Looking for a tennis stringing machine which is easy to use and easy to place in your home? Look no further.The Gamma 5003 is a professional tennis stringing machine utilizing a manual spring tension winder which is easy to use. The Gamma 5003 comes on its own adjustable stand making it easy to place (no need to find the right height table) and it does not need electricity so you are not limited to the only corner of the room which has a power outlet. The tensioning range is 9 to 90 lbs (4 to 41 kgs). Although the Gamma 5003 is a professional tennis stringing machine it is also ideal for home stringing. It provides a number of options to choose from and it’s a high quality stringing machine. The self-centering quick mount system (either 2 point or 6 point) is advantageous if you want to save time, particularly if you string a variety of different rackets with different head sizes and shapes. The Gamma 5003 with self-centering lets you mount the racket quickly and accurately with minimal manual intervention when you first put the racket on the stringing machine. You only need to turn one of the two knobs located at either end of the turntable to move the north and south mounting stands at the same time. This means there is only one knob to turn rather than using an allen wrench to loosen and tighten each mounting stand individually and then moving each side of the mounting system in or out a little to accommodate the head of the racket. There are, of course, additional knobs to secure the racket once it is centered. 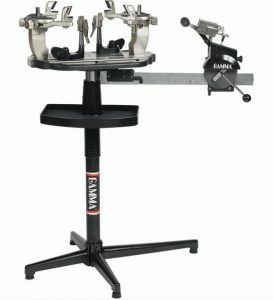 The Gamma 5003 with 2 point self-centering provides sufficiently strong mounting to complete the stringing job with accurate tension throughout the string bed. This system is similar to the Prince Neos tennis stringing machines. The advantage of the 2 point mounting is that it provides greater access to the strings. This means you don’t have to work around the arms with the string or the clamps. However, the Gamma 5003 with 6 point self-centering provides extra support for the racket head. Many people do not think this extra support is necessary but if you are concerned about distortion and risk to your racket or you want extra assurance that the tension is correct throughout the string bed then it is probably wise to purchase the 6 point mounting option. The only reason the 2 point self-centering quick mount system is more expensive than the 6 point self-centering quick mount system is because of the extra cost in the manufacturing process. It is not necessarily superior in function. It is more a matter of personal preference as to which one you prefer. The Gamma 5003 also comes with the option of 6 point quick mounting without self-centering. The reason most people buy this model is because they are not aware that the 6 point with self-centering is available. The model with self-centering has been available from Gamma for fewer years. It is a little bit more expensive than the model without self-centering but probably worth a few extra dollars considering how much time and effort it will save you over the life of your tennis stringing machine. As mentioned, the Gamma 5003 tennis stringing machine comes on its own stand. The stand for the Gamma 5003 is adjustable from 36 to 48 inches. This provides flexibility for different family members, or employees, to string comfortably. This height range offers much greater range than many other stands on tennis stringing machines. The Gamma 5003 uses a diamond coated string gripper and the Gamma patented rotational string guide to allow you to achieve accurate tension throughout the string bed. The diamond coating adds friction to the gripper so less pressure is needed to grip the string and this lowers the potential for any damage to the string. The Gamma 5003 tennis stringing machine uses the dual action swivel base type of fixed clamps – the clamp that grips the string operates independently from the base of the clamp. The quick action rotating swivel string clamp bases on the Gamma 5003 are coupled with the top diamond coated string clamps which provide a self-locking adjustment knob to hold strings with less clamping pressure. The advantage of the bottom part of the Gamma clamp (i.e. the base) is that it is relatively maintenance free. The advantage of the top part of the Gamma clamp (i.e. the string gripping part) is that the diamond coating as well as the self-locking adjustment knob provide the advantage of holding the string with lower pressure on the actual string therefore reducing the risk of damage during the stringing process. The Gamma 5003 provides a 360 degree turntable rotation which can be locked at any position. The Gamma 5003 tennis stringing machine provides a large 141 square inch tool tray as standard and there is a Gamma custom cover which is sold separately (click here to see the Gamma cover). In comparison to a table top drop weight tennis stringing machine the Gamma 5003 is much faster for stringing rackets. Once someone is familiar with their stringing machine they usually take about 30 minutes to complete a racket on a spring tension winder tennis stringing machine compared to about 45 minutes using a drop weight machine. Drop weight tennis stringing machines (like the Gamma X-6FC or the Gamma Progression II 602FC) are generally said to be the most accurate of tennis stringing machines. 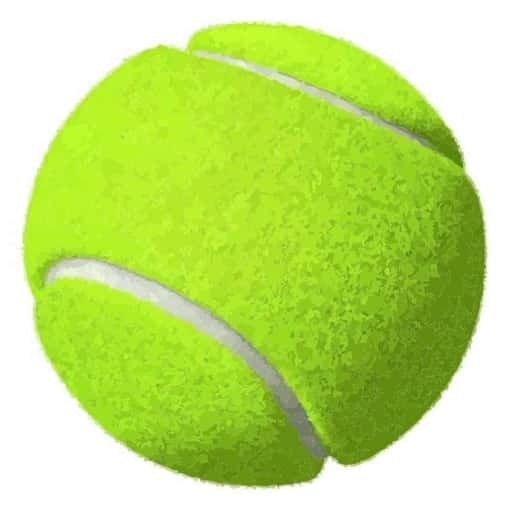 In comparison, the spring tension winder tennis springing machine is said to be less accurate with regard to tension. 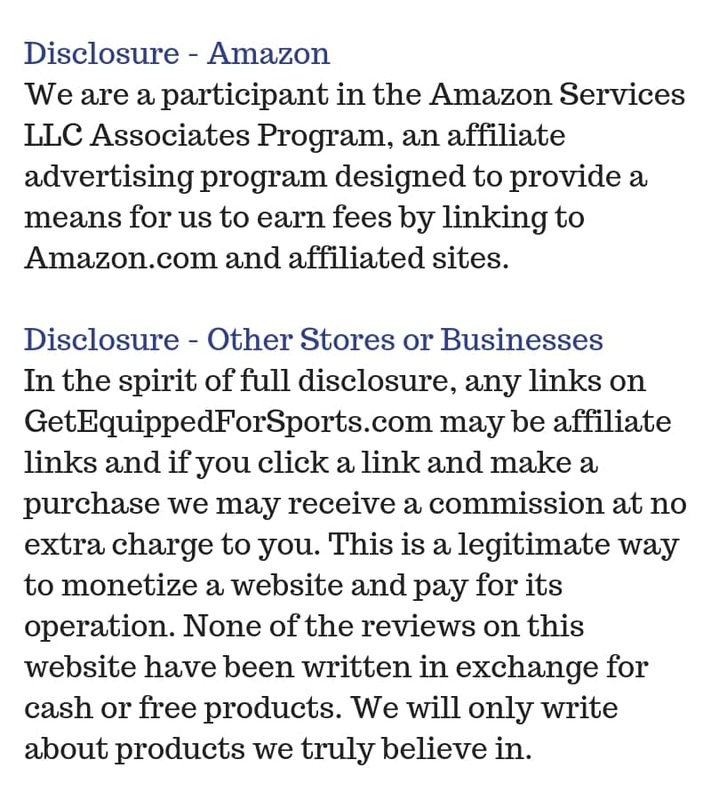 There are two factors to consider here. The first is that the spring tension winder tennis stringing machine, like the Gamma 5003, is very consistent. So, once you find the appropriate tension you can keep stringing at that tension again and again. The second factor is that if you own a high quality tennis stringing machine like the Gamma 5003 and you turn the winder very slowly you usually achieve a very accurate tension result anyway. Even when you turn the winder slowly you are still stringing a racket much faster than you would when using a drop weight stringing machine. 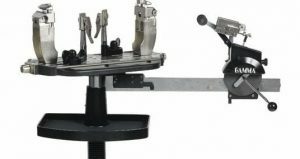 Who uses spring tension winder stringing machines? 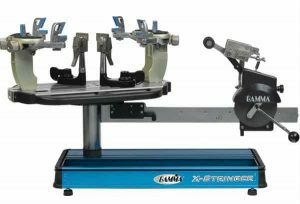 Most pro shops use an electronic tennis stringing machine for their stringing service but if you look around you will also see some of them using spring tension winder stringing machines, like the professional Gamma 5003. In comparison it is almost impossible to find a pro shop that uses a drop weight machine. Therefore I think you can draw your own conclusion with regard to the trade-off between speed and accuracy for a spring tension winder stringing machine versus a drop weight stringing machine. The Gamma 5003 tennis stringing machine is a professional machine which is still within an acceptable price range for a lot of home stringers. With the advantage of not needing access to electricity it offers convenience as well as speed for stringing rackets. It is also great to have the choice of buying a model with the self-centering mounting feature. Why is a Spring Tension Winder Tennis Stringing Machine Less Accurate in Tension? Above, we talked about how the Gamma 5003 is very fast, very consistent but less accurate on tension. Why are spring tension winders less accurate? If you use a digital scale to calibrate a spring tension stringing machine, you’ll notice that if you set the tension to 60lbs, the scale will show 59…then 58…then 57. This is because the tension is set for the maximum tension. But after the maximum tension is reached, the string begins to relax immediately. On a drop weight or electronic stringing machine, the machine keeps pulling the tension to maintain the maximum tension. On a spring tension machine it doesn’t pull more tension after the maximum is reached. This is perfectly normal on a spring tension winder machine. It’s the way they work. On an electronic or drop weight stringing machine it will keep pulling the relaxation out of the string. The machine does this to try and maintain the set tension. The drop weight and electronic machines are constant pull machines. However, the accuracy for a drop weight machine depends on the person using it. And the accuracy on an electronic machine depends on the quality of the machine. If you’ve been stringing on a constant pull machine and you switch to a spring tension winder machine, you’ll notice a drop in tension. To maintain the same stiffness in your strings you may want to increase the tension by 5-10%. Some people just add 1-3lbs to their usual tension. You can experiment to see what suits your game. As mentioned above, once you become familiar with the tension you want for your racket, you can get good accuracy from a spring tension winder machine because it is very consistent. You might be wondering what the difference is between the Gamma 5003 stringing machine and the Gamma X-ST. They are both spring tension winder machines. The first difference you’ll notice is that the Gamma X-ST is a table top model. But there is a stand available to be bought separately. Whereas the Gamma 5003 comes with its own stand included. The Gamma 5003 is available in three different models, as mentioned above. Most people looking at the Gamma 5003 are interested in one of the “self-centering” models. In comparison, the Gamma X-ST is a “Quick Mount” system (not self-centered). You will find the self-centering system to be faster. But both of these spring tension winder machines are fast compared to the drop weight stringing machines. So, it depends on your perspective. The Gamma X-ST is obviously a cheaper model. However, once you add the cost of the stand it’s starting to get closer in price to the Gamma 5003. If you’re looking at the Gamma X-ST plus a stand, definitely think about getting the Gamma 5003 with self-centering. But if cost is the deciding factor, get the Gamma X-ST and use it on a table. You can buy the stand later when it suits your budget. ⇒ Need more details on the Gamma X-ST? See more here.